Trust me, this chicken galantina never stays long on the buffet table each time I serve it during our parties at home. Well, unless I double up the usual quantity, it’s never going to reach the ‘leftover’ stage. Okay, in case, there’s going to be some leftover galantina slices, what can you do with it? Ahh, this dish I so like! I make a killer sauce by just sauteing in a skillet 1 medium-sized onion (minced), 4 cloves of garlic (chopped), 4 ripe tomatoes (seeded and diced), 1 red bell pepper (finely cubed) and a teaspoon of fresh basil leaves (chopped). I season it with salt and pepper and would give it a swig of lemon juice (about 2 tbsps) for some great flavor. Add about 1/4 cup of water to yield better consistency. Continue simmering until sauce has been reduced by 1/4 from the original amount. The secret is in the ripeness of the tomato and the manner by which you slow cook it to let the juices flow naturally while simmering it without drying it out too soon. 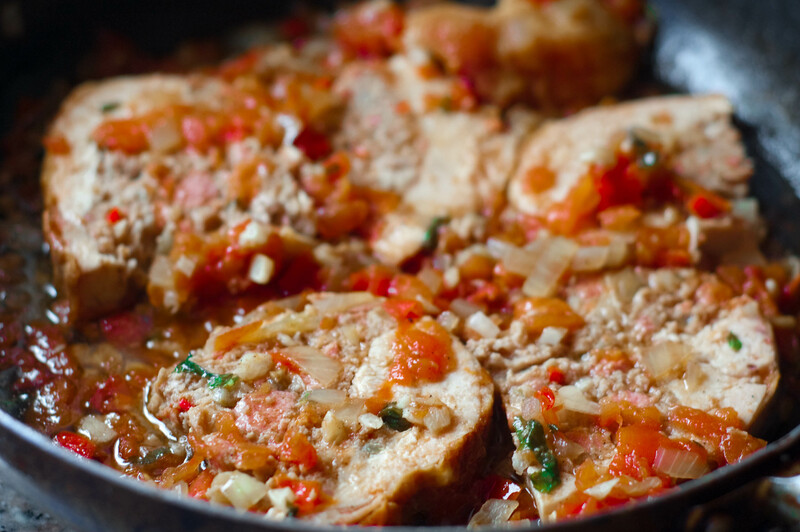 When sauce is done, assemble galantina slices in the skillet while you continue to simmer them with the sauce. Can I use embutido or meatloaf for this recipe that looks so yummy? Thanks and more power! Yes, definitely. Embotido or meatloaf would be perfect for this. You might also want to try eating this with a slice of cheddar cheese on the side. It’s gastronomic!